From Monday 9th April our online booking fee will be reduced from €1.50 per ticket to €1 per ticket, and it will now apply equally to all telephone and in person bookings. That means that all tickets sold by An Grianán Box Office will be subject to a €1 booking fee. Our new box office opening hours for telephone and walk in bookings will be from 10 am to 5pm Monday to Friday, and also on the days when we have a show it will be open from 6pm to 8pm, this includes Saturdays and Sundays. The Eatery Cafe hours will not be affected by these changes. Its opening hours are 9.30am to 3.30pm Monday to Friday. Call in to our Box Office during opening hours: Mon to Fri 10am to 5pm. On days we have an evening show the box office will be open from 6pm to 8pm. Closed Saturdays, Sundays and Bank Holidays unless there is a show in which case the box office will be open for two hours before the performance. There is a €1 booking fee per ticket. These booking fees are non-refundable and cannot be exchanged for credit. VISA, Mastercard and Laser cards are accepted. Normal box office hours apply. Please direct all calls regarding ticket booking to our box office on 074 912 0777 (dial 1 for box office). All other queries including info on venue hire, tech specs, etc., should be directed to our admin office on 074 9120777 (dial 2 for admin). Please note the admin office cannot take ticket bookings. Just write to us at The Box Office, An Grianán Theatre, Port Rd, Letterkenny, Co Donegal F92 RV1F. Please state the performance, the date & time of the performance and enclose a cheque or postal order payable to An Grianán Theatre. Don’t forget to ring and check availability before sending off your payment. There is a €1 booking fee per ticket. These booking fees are non-refundable and cannot be exchanged for credit. If you wish to have tickets posted to you include a stamped addressed envelope otherwise there is a €2 postage fee. 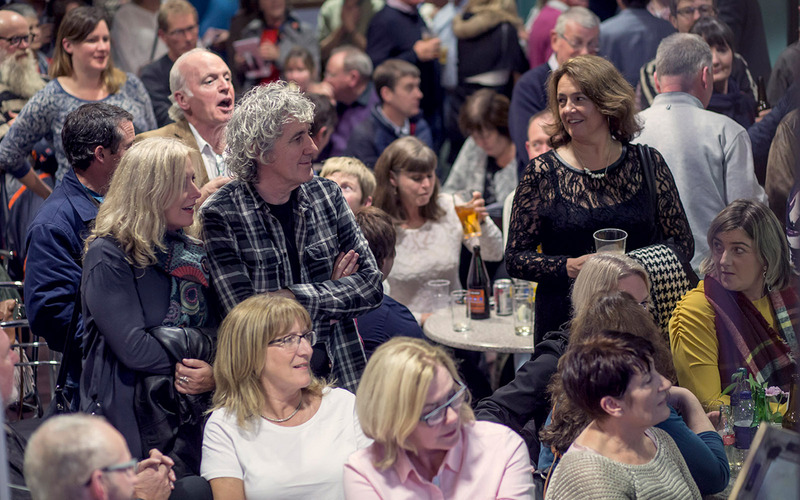 You can book online for most of our events. Just click on the Book Online link for your chosen event and follow the instructions. All our online bookings are powered by our partner organisation Ticketsolve. Postal and phone bookings will be held at The Box Office to be collected. We recommend that you collect your tickets at least 15 minutes before the performance starts. NB: in instances where we are selling tickets for events not taking place in An Grianán Theatre tickets will be available at the host venue for collection on the door. If you would prefer to have your tickets posted out please tell us at the start of your booking to avoid having multiple transactions on your credit/debit card. There is a €2 fee for this service. Tickets may be exchanged for a credit voucher (minus the cost of any booking fees). Tickets must be exchanged at least 24 hours prior to the performance and within box office opening hours. If you have already collected your tickets you MUST return the tickets to us before you can exchange them. Credit vouchers remain valid for one year from date of issue. The management reserve the right to refuse admission and to alter the cast of a production due to unforseen circumstances. For safety reasons, buggies or carrycots are not permitted in the auditorium. Cameras or recording devices are not permitted in the auditorium. NB: Mobile phones and pagers must be switched off during performances. We offer concessionary rate to students, over 65s, under 18s, unemployed and registered disabled. Current ID is essential to avail of these concessions. Concessions may not be available for some shows. School groups can avail of special rates for many shows – contact Daithi at the box office for further information. All performances start at 8pm unless otherwise stated. Shows start on time, please don’t be late! Latecomers will only be admitted if there is a suitable break, which is some cases may be the interval. Traffic can be extremely heavy in Letterkenny especially at the weekend so please allow ample time for your journey. We strongly advise allowing ample time to find a parking space and to be mindful that traffic can be extremely heavy in Letterkenny particularly on Thursday and Friday evenings and weekends. An Grianán’s Café Bar is open from 9.30am to 3.30pm Mon to Fri, serving full meals, snacks and fine coffee. Take away service also available. Group bookings are welcomed. A full bar service is available before and after each performance. The cafe can also arrange catering for private parties and functions. Find out more. All areas of the theatre are non-smoking, in line with government legislation. This includes all Electronic cigarettes (e-cig or e-cigarette), personal vaporizer (PV) or electronic nicotine delivery system (ENDS). Ash bins are provided on the exterior of the building for your convenience. 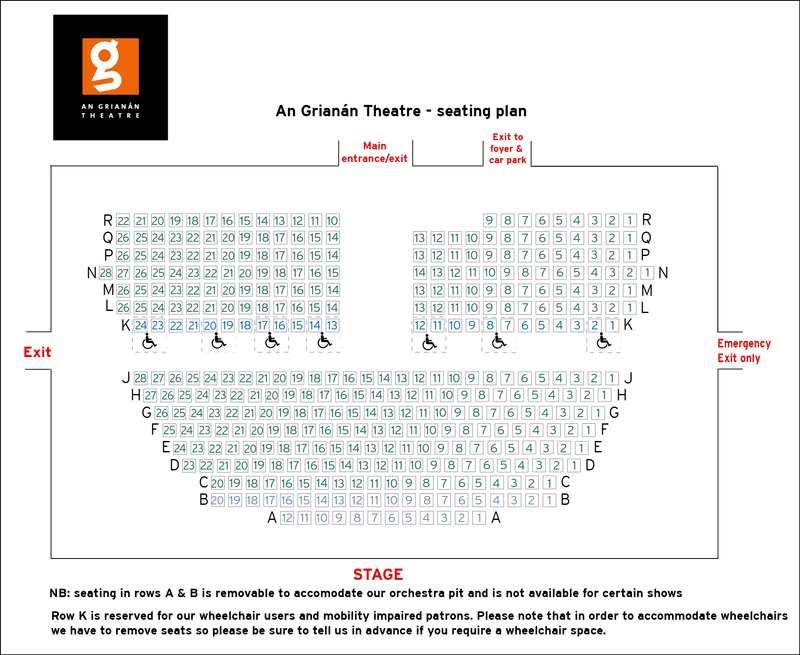 An Grianán Theatre is dedicated to being accessible to all members of the community. We very much welcome bookings from people with disabilities, both from individuals and groups. Please let us know about your requirements at the time of booking. We have an induction loop system for the hearing impaired. Use the T setting on your hearing aid to avail of this. They can be redeemed for events on sale at our box office only and in our cafe. Find out more.